What is the NORM.INV Function? The NORM.INV Function is categorized under Statistical functionsFunctionsList of the most important Excel functions for financial analysts. This cheat sheet covers 100s of functions that are critical to know as an Excel analyst. It will calculate the inverse of the normal cumulative distribution for a supplied value of x, and a given distribution mean and standard deviation. The function will calculate the probability to the left of any particular point in a normal distribution. For example, suppose we are given a normally distributed random variable that is denoted by x. For the value of x, if we wish to get the bottom 5% of the distribution, we can use the NORM.INV function. As a financial analystFinancial Analyst Job DescriptionSee a real Financial Analyst Job Description including all the skills, experience, and education required to be the successful candidate for the job. Perform financial forecasting, reporting, and operational metrics tracking, analyze financial data, create financial models, the function is useful in stock market analysis. We can use NORM.INV to understand how a portfolio is affected by any additions or withdrawals made. Probability (required argument) – It is the probability corresponding to normal distribution. It is the value at which we want to evaluate the inverse function. 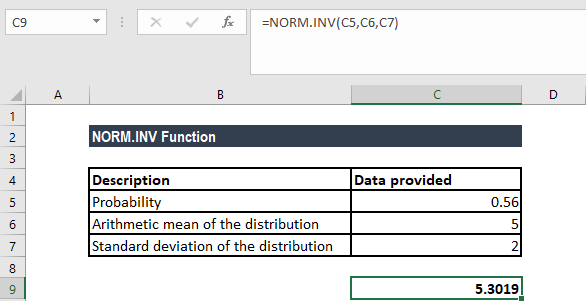 How to use the NORM.INV Function in Excel? 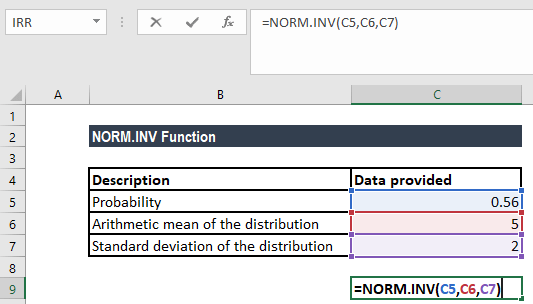 If the mean equals zero and the standard deviation equals 1, NORM.INV uses the standard normal distribution. #VALUE! error – Occurs if any of the given arguments is non-numeric. The given probability argument is less than zero or greater than one. The given standard_dev argument is less than or equal to zero.